Record better beats and more! Rhythm has added a number of special edition digital magazines to its app on Newsstand for iPad, iPod and iTouch aimed at helping you record and produce better beats. To check them out download the Rhythm app from the App Store (or open it up if you already have it) and tap the Specials tab to see what's on offer. Learn how to record and process perfect drum tracks straight to your laptop or PC, plus program dance beats and process and mix drums of any genre. It really is the ultimate guide for any drummer! The ultimate collection of production advice. This huge reference tome covers basics to streamline your workflow, through to advanced techniques in mixing, mastering and effects. Put the best musical gear in your studio with this up-to-date gear guide. With expert gear reviews and head-to-heads, all today's tech is explored and explained. The aim of the guide is to simplify the process of building your dream home studio set-up. 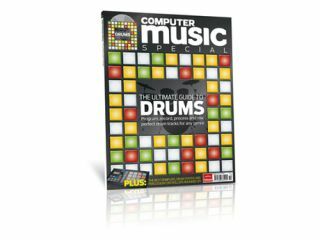 This special is full of step-by-step walkthroughs on everything from making music with loops and software instruments to recording drums, guitars and vocals. Whatever your experience level, it'll improve your skills - and there's even a guide to Garageband for iPad. Power Up Your Drums - Rivitalise your drum kit today! 100 Drum Heroes - 100 of the greatest drummers of all time interviewed and profiled. Green Day digital special - New and classic interviews, HD video tutorials for drummers, interactive features and more! Don't forget, if you're new to the Rhythm app you can also enjoy a free trial subscription to check out the UK's best-selling drum mag!